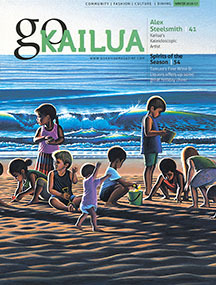 Go Kailua magazine recently visited Alex's studio and interviewed him about his artwork, life, and career. The story is featured on the cover of the current issue. To view the article ("Alex Steelsmith: Kailua's Kaleidoscopic Artist"), click here and scroll down.